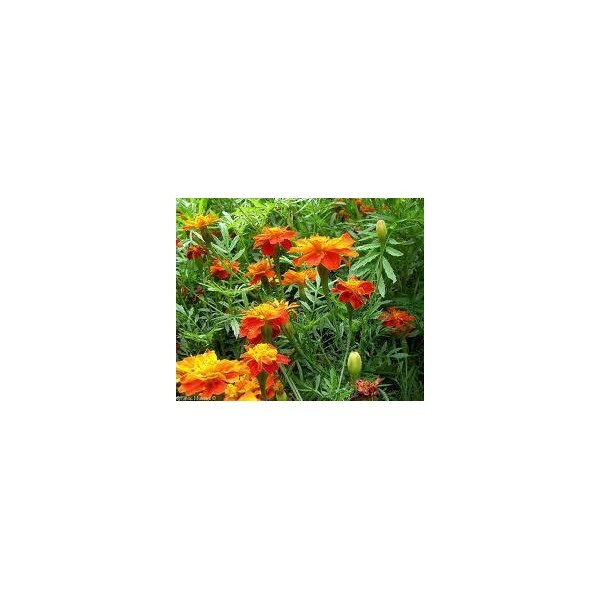 500+ Organically Grown - French Marigold Seeds (Tagetes Patula, Asteraceae), Non-GMO and Pesticides Free! I have grown and used these for years (in and around) my vegetable garden to keep deer and wildlife out and to attract pollinators. Colors included: yellow, orange, brick-red, brick-red with orange-yellow edging on petals, orange with yellow edging on petals and other variations... Some benefits and uses: Pollinating insects, especially bees, are necessary for the success of your flower or vegetable garden and French Marigolds are the best way of attracting pollinators!! They also attract butterflies and Hoverflies. Hoverflies (sometimes called flower flies) are important pollinators of flowering plants, whose larvae play a role in feeding on aphids! Adult hoverflies which may look like a cross between a fly and a bee, can neither sting nor bite as they do not have stingers, and their mouths are formed more for collecting nectar than for biting. The French marigold is often used as a companion plant, especially for growing amongst tomatoes and potatoes where it helps to repel pests. 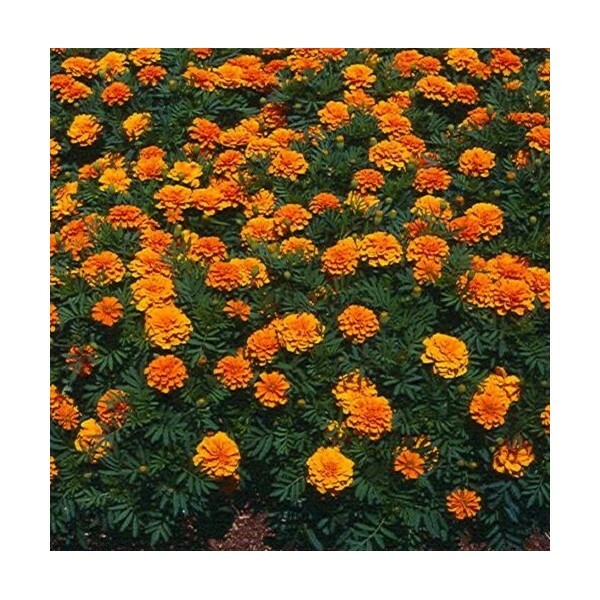 French Marigolds will repel deer and other wildlife, asparagus beetles, bean beetles, cabbage moths, tomato hornworms, whiteflies and bad nematodes. The roots of French marigolds contain a substance which is toxic to certain types of nematodes. Secretions from the roots of growing plants have an insecticidal effect on the soil, effective against nematodes and to some extent against keeled slugs. These secretions are produced about 3 - 4 months after sowing. Nematodes are soil inhabiting microscopic roundworms that damage many species of plants. 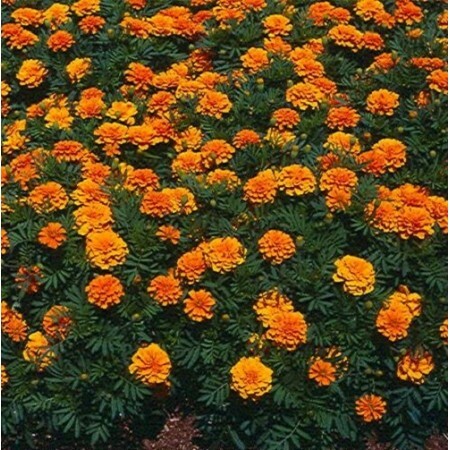 Certain nematodes can be eliminated from a site by growing a thick crop of marigolds for one season prior to planting the vegetables or fruit crops, or by interplanting marigolds between crop rows. Marigolds also repel the cabbageworm that attacks plants in the cabbage family. Planting marigolds with cabbage, cauliflower, broccoli and brussels sprouts deters cabbageworms and adds bright color to the garden. The petals are edible and often used in soups and salads and there are also many medicinal uses for French Marigolds. They are also great for fresh and dried flower arrangements, and organic potpourri and sachets. What more can a gardener desire in a flowering plant? :) Do not over-fertilize to avoid excessive foliage growth and fewer blooms. Marigolds produce more flowers in poorer quality soil, advises The Old Farmer's Almanac! Marigolds are allelopathic, which means they produce a chemical that is poisonous to other living things. While the flower petals are safe for people to enjoy in salads or tea, the roots produce a compound called alpha-terthienyl that is toxic to several kinds of insects and various fungi, bacteria and viruses. It is not clear if this chemical has any direct impact on deer, but it is known that deer tend to avoid plants that are poisonous or that have a strong scent or bitter flavor. Based on observation, deer at least seem to be put off by the strong smell of marigolds. 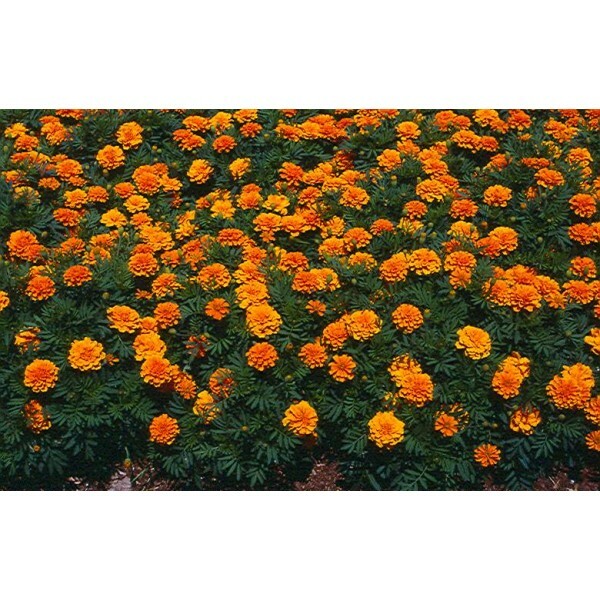 Planted in and around a vegetable garden or along the natural edge of your property, you can also intermix clumps of marigolds (three to five plants) with your other plants within the garden. These plants have been known to grow into bushy mounds of flowers about 1-2 feet tall with a 1-2 foot spread, and they will be stunted if kept in flower post as they have long tap roots that can go down 2 feet or more and are great for aerating the soil! USDA Zones: 2-9 (Canada to Florida) Maturation: Annual, may self-seed the following year. Germination: Seeds sprout in 5-10 days. Viability: 90% (Packaged for the 2015 Season) Direct sow: You can sow seeds directly into the ground or in flats to transplant later. Transplant: Space about 6-12 inches apart when transplanting outside. Light and Soil: Likes full sun and grows in well-drained soil mix containing manure or compost. Blooming time: From early summer to late fall (deadhead fading blossoms). Edible parts: Flower petals have a tangy citrus-flavor and can be used in salads and many other dishes. Dried and crumbled petals can pinch-hit for oh-so-expensive saffron in casseroles, breads, and omelets, adding a unique, subtle flavor to these dishes. Stir-fried—alone or with vegetables—the petals add zip to any meal. They're also colorful and tasty in rice, soups, or stews, or when sprinkled on salads. Furthermore, the flower petals are nutritious! They contain carotene, which can be converted in humans to vitamin A.